If you are a new business owner needing a commercial waste disposal service you are in the right place. 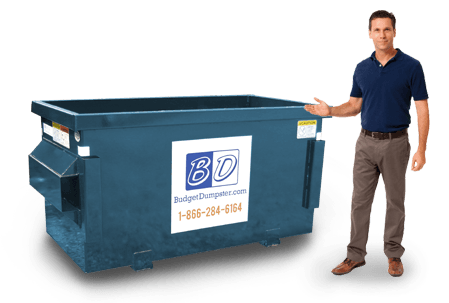 Here at Budget Dumpster, we offer low monthly rates that will make you and your wallet happy. If you are a new business owner, the last thing you are thinking about is your weekly trash pickup. We will make your commercial waste disposal as stress-free as possible. Every unit we offer comes with a one year contract for scheduled waste removal. If you own a small business or a large business we got you covered. We offer sizes ranging from 2 cubic yards to 8 cubic yards guaranteeing to have the perfect size commercial dumpster for your business. So check off waste removal off your list and give Budget Dumpster a call! Here at Budget Dumpster, every customer of ours is a priority. It doesn't matter what type of business you manage. Whether you manage a large warehouse or a small boutique. We will give you the best service possible. 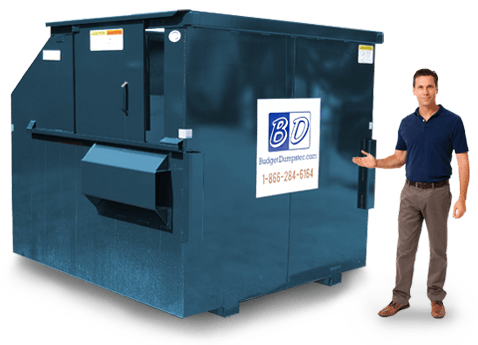 Our customer service representatives will be able set you up with a commercial dumpster that suites your disposal needs. You may need a 2 cubic yard which is our smallest, or you may need an 8 cubic yard which is our largest. 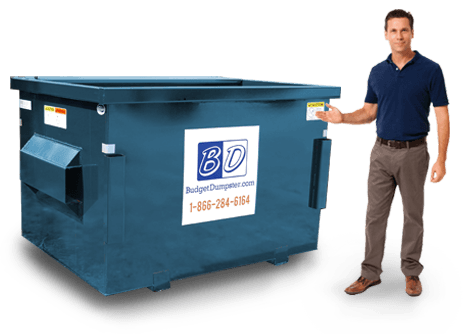 Either way, we guarantee we offer a dumpster size that is perfect for your business. And if you are concerned about the size of your monthly bill, fret not. We don't itemize the bill into different categories such as disposal fees or environmental fees and our billing process is completely transparent. 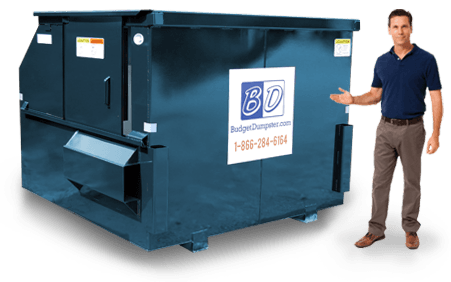 Attention business owners who manage a small restaurant or boutique, we have the perfect size dumpster for you. Our 2 yard commercial dumpster is commonly used for businesses with less than 2,500 square feet. But do not think this dumpster can't handle waste. It can hold between 600-800 lbs. of waste. That is equivalent of a one ton pickup truck. If you don't have a lot of placement options, don't worry, it has a small footprint that leaves plenty of room. So you can place it in the back of the store or parking lot without taking up much space. This 2 yarder is only 3 feet high making it easy to dispose waste. If you are a smaller business, this is the best space-saving and wallet-sparing option. Our 4 yard commercial dumpster is considered a size medium. It is commonly used for medium-sized restaurants that produce small-to-medium waste streams. It is also common for small grocers, service stations and places of worship that only occupy less than 5,000 square feet of space. This commercial dumpster can hold between 800-1000 lbs. of waste which is equivalent to two pickup trucks worth of debris. It is also handy for the occasional bulky material such as wood pallets or computer chairs. The 4 yarder is a great in-between size that gives you a variety of placement options. It is 6 feet wide and 4 feet long, making it the perfect size. The second largest commercial dumpster is referred to as "The All-Arounder." You can find the 6 yard commercial dumpster practically anywhere. Apartment complexes, office buildings, grocery stores, hotels, you name it. This dumpster can hold between 1200 to 1400 lbs. of waste. Larger apartment complexes and grocery stores have a high waste stream every week. They need a dumpster that can handle the occasional bulky materials. Don't worry about throwing heavy trash bags over the top. Every dumpster is equipped with an accessible sliding door making it easy to throw out waste. We call our largest dumpster "The Big Daddy." The 8 yarder can hold up to 1600 lbs. of waste. It is the perfect option for large commercial settings. This dumpster size is handy for the occasional bulky materials grocers and warehouses would produce. It can also handle the miscellaneous materials you would dispose of during moving day at your apartment complex. Don't worry about the hassle of loading up the dumpster. Every unit comes with an easily accessible sliding door. It doesn't matter the type of large business you own. It can handle a high volume of waste on a weekly basis.